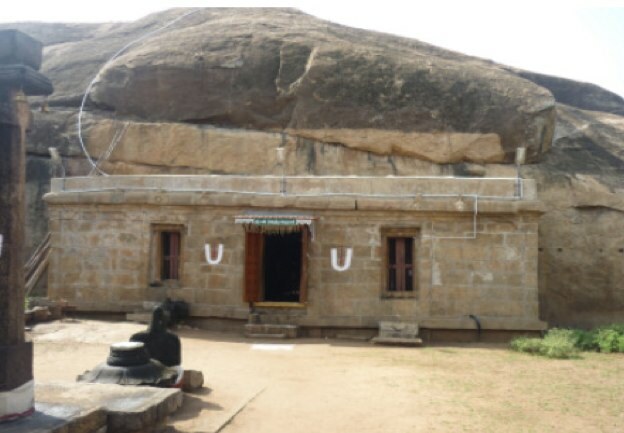 Located 35kms North of Madras off the Calcutta Highway is the Kari Krishna Perumal koil in Thiru Aayarpadi, Ponneri, a temple that dates back to the rule of Kari Kala Chozha, one of the greatest among the early Chozha kings. 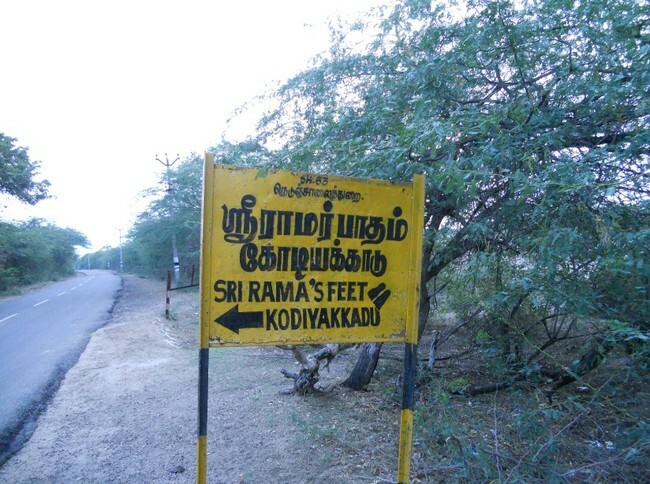 This temple is believed to have been built during his period and hence has been named after him. With a Kondai (bun like tuft) on his head, Kari Krishna has his left hand on his hip in a majestic king like stance. His right leg is slightly down on a pit while his left leg is normal. Hence, one finds the moolavar swayambu archa-vigraha in a standing posture slanting slightly towards his right. 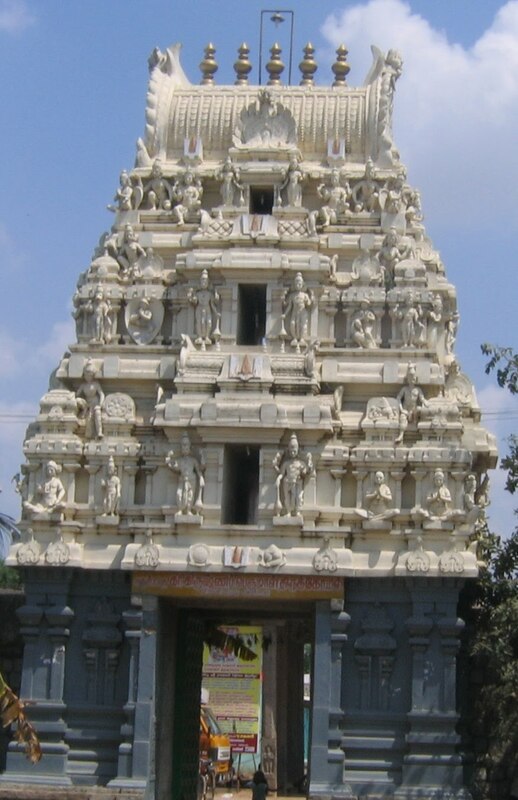 All the pillars in the mandapam in front of the temple are also seen slanting towards one side. Interestingly, there is no peedam for the Lord. He is seen standing on the ground just like us!!! 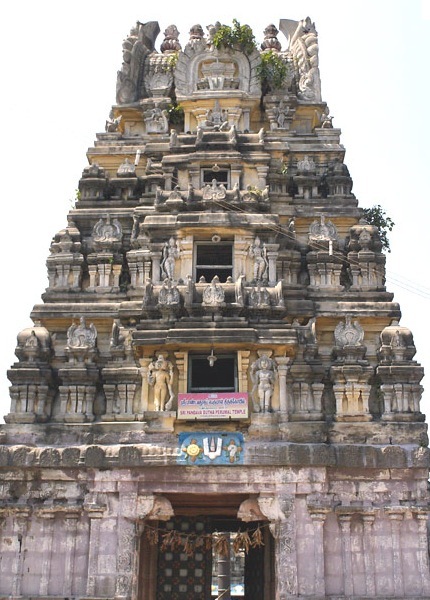 Another unique feature at this temple is that Soundaravalli Thaayar is seen to the left of the Kari Krishna Sannidhi, facing the East. 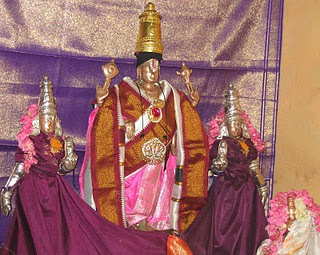 In Vishnu temples, one normally finds the Thaaayar Sannidhi to the right of Moolavar deity. Baradwaja Maha Rishi is said to have undertaken penance at this temple and Agastya Rishi is undertook penance at this place invoking the blessings of Lord Shiva. 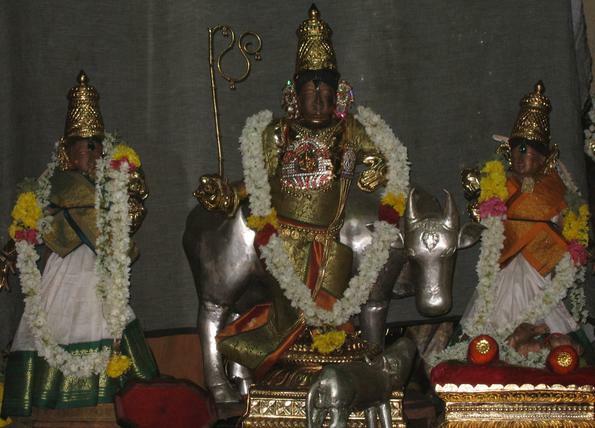 Pleased with their prayers, Lord Vishnu is said to have appeared before Baradwaja Rishi and Lord Shiva before Sage Agastya and acceded to their request of providing joint darshan to the devotees. In accordance with this event, every year on the 5th day of Chitrai, Kari Krishna Perumal leaves on a procession to the bazaar street in Ponneri where he meets with Lord Shiva and exchanges garland. As Lord Shiva met with Lord Vishnu here, this street has come to be called Hari-Haran bazaar street. Aother unique feature of this temple is that it is surrounded by water in the front as well as the back of the temple. Behind the Sanctum is Santhana Pushkarani said to be very sacred, especially for child birth. In front of the temple, on the Northern side is the Arani River. Sub-Urban trains ply between Chennai Central and Ponneri ( Gummudipoondi route) every half hour It will take about 1 hour to reach Ponneri from Chennai Central Station.